Candle wax! You may recall that I am psycho over the 'Fresh Balsam' candles from Bath and Body Works and want to douse my body with the home fragrance oil. Well, when the candles dwindled down to nothing after burning them every night, I couldn't bear to just throw them away. So, I would pop them in the freezer overnight and then go all Sharon-Stone-in-Basic-Instinct on the wax until it was all chopped up. And into a baggie the wax would go, to later be used in this wax warmer thingy....what the heck are these things called, anyway? Anyway, this is not the point of my post. The POINT is that the wax, while deliciously scented, is also a practical way to help your drawers slide more freely. 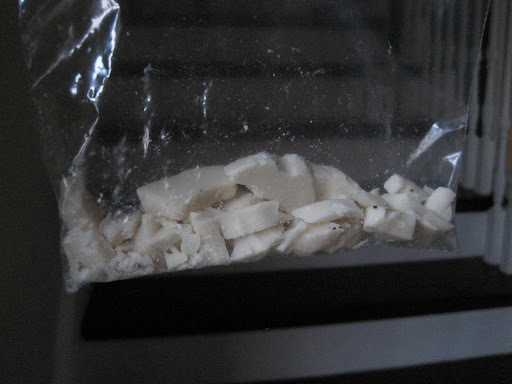 I grabbed my baggie, took out the largest wax pieces, and started giving the wood drawer supports inside the frame a rubdown they would not soon forget. Boom chicka bow wow! I also rubbed some on the bottom of the drawers themselves. Then I put the drawers in and opened and closed them a few times. Do not be alarmed if they seem to stick even worse, once the wax is 'rubbed smooth' over a few days, those drawers will slide like a knife through butta! Problem solved! And that is why I love to chop up candles. It has nothing to do with my repressed aggression. Soap works great too - Bar soap, not liquid. We just used parafin wax - but good to know left over candle wax will do the trick as well!! Bwahahahaha @ "a rubdown they would not soon forget. Boom chicka bow wow." I have a sudden urge to smoke a cigarette or high-five you or hope that you'll still respect me in the morning. This is genius! Thanks for the tip! That drawer looks might fine w/ the snappy liner & drawer pull. It's great to know that this actually works. I remember reading about it through Martha but never needed to try it out. Thanks for the tip! Great tip! Way to use every last drop of wax and even the jars! Love the drawer liners! Which were not the subject of this post, but still. 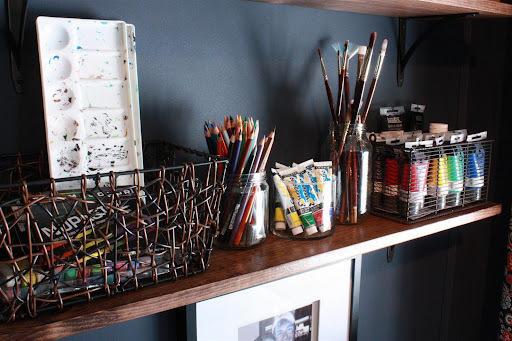 What a great solution, and the drawer liners are so much fun! tart warmers, they're called tart warmers. lol. Eric and Sharon - Yes, I had read about the soap but we don't have one bar of soap in our house, it's all liquid! I may bring home one from my next hotel stay though. I imagine the soap would work even faster to loosen things up! Jill - yes, tart warmers! Thank you! To everyone interested, the drawer liner is Kartha Stewart, from Kmart a couple years ago. Wow, what a great tip! Hmm, would it work on drawers that have wheels and slides, too? Or would it just gunk them up? I have a kitchen drawer that likes to stick, and considering I only have 4 drawers in the entire kitchen - it's not very much fun. 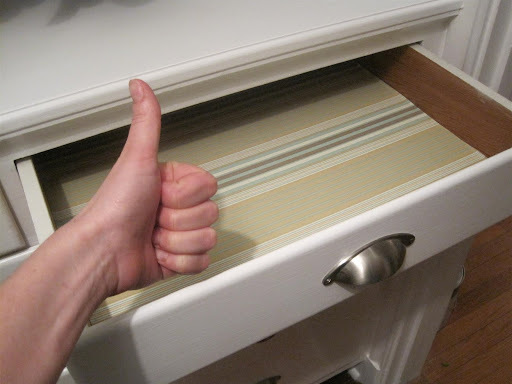 :) And I agree with everyone - those drawer liners are just too cute! It's a good thing you're so resourceful and had some leftover wax laying around! Just goes to show you should think twice before throwing anything away! Chelsea, I think straight up WD-40 or some other sort of oil is better for drawers with slides. However, I don't think the wax would hurt anything. Bahaha! Between the rub down and title 'sticky situation,' I'm feeling slightly uncomfortable. It sounds like you know how to work your hands! Genius idea. And that drawer deserves all the attention it's getting. The crisp white, the pulls, and that fabulous drawer liner...I'm in love! This is too smart! Thanks for another great tip!! I'm another one that has always used a bar soap to make drawers slide easier, but I never thought of using the end of my candles in my tart warmer. Thanks for the tip! Clever. And I love your thumb up. whoa, is it getting hot in here or is it just me?! Hey, now I know what to do with all the stubs that are left, thanks for this! That is a very handy tip! I hate having all that leftover candle wax. We recently got some free (old) furniture that might benefit from this tip.